THE STELLA MCCARTNEY SC0001S-001 IS A BLACK SIGNATURE WAYFARER WITH SILVER FRONT FACING PINS. 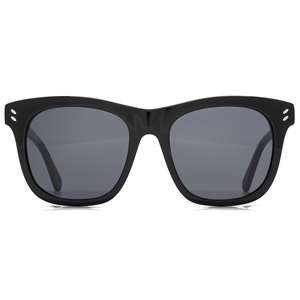 THE CLASSIC DESIGN IS TIMELESS AND IS IDEAL FOR THOSE WHO LIKE SUNGLASSES WITH DISCRETE BRANDING. THE WAYFARER STYLE OF THIS FRAME MAKES IT SUITABLE FOR ALL FACE SHAPES AND MALE AND FEMALE ALIKE SO A PERFECT HIS N HER OR SHARING FRAME.